In my last blog post about using the MVC Framework inside Sitecore, I announced that I’d write another blog post on how to actually create a real world application with MVC inside Sitecore. The first blog post was just a proof of concept, creating a real world application with it, helps completing the code. 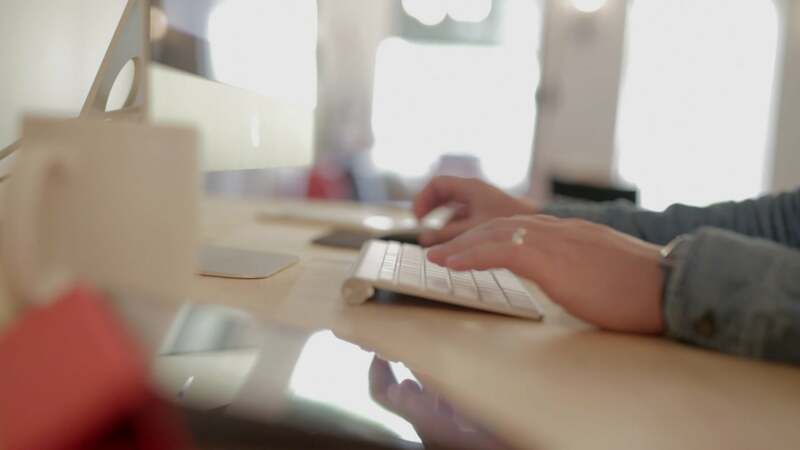 Sitecore has announced that it will support MVC in Sitecore version 6.6. Great news! 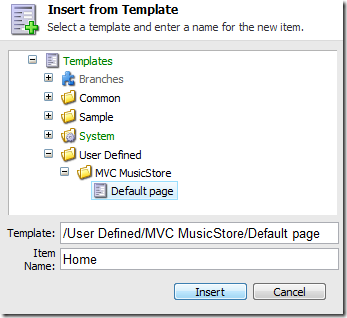 This tutorial will use the technical preview of Sitecore 6.6 to rebuild the mvc musicstore inside a Sitecore environment. 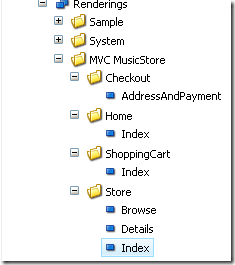 Since Microsoft has already created a nice tutorial for getting started with ASP.NET MVC : MVC Music Store tutorial. 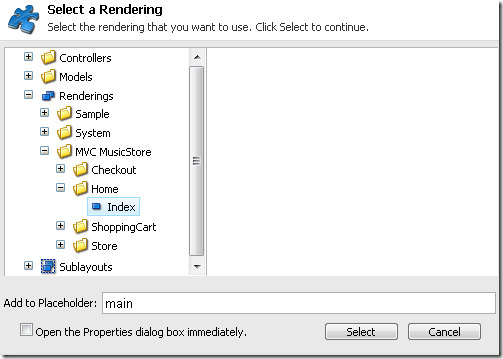 I figured it’d also be a nice tutorial to get started with MVC inside Sitecore. It’s an easy to follow, small tutorial, which makes it easy to go through for both experts and beginners in the world of MVC. Experts can just skip the parts explaining how MVC itself works and go straight to the action. For beginners, the entire tutorial takes less then 2 hours. It will be the best invested 2 hours of your programmer’s life so far :)! Once you have completed the Microsoft tutorial, the steps in this blog-post will help you transform it to a Sitecore project. Follow the instructions given by John West to get Sitecore 6.6 with MVC support up and running. Now open the Sitecore project in visual studio, and add the project you just copied to your solution (File > Add > Existing project). 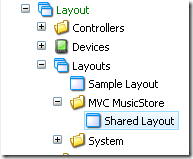 Copy the connectionstring in the web.config of the original created MVCMusicStore project, to the App_ConfigConnectionstrings.config inside your sitecore solution. These first 5 steps were the steps required to get an existing MVC application working inside the sitecore wwwroot. 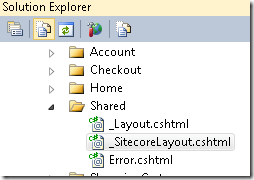 Now we’ll start modifying the existing app to become an application fully powered by sitecore! 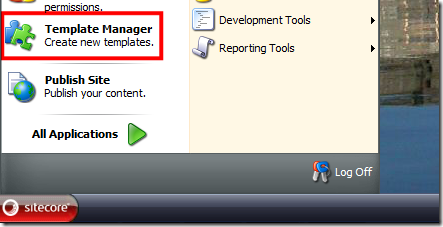 Run your application, and go the the Sitecore desktop (/sitecore/shell/default.aspx) and open the template manager. 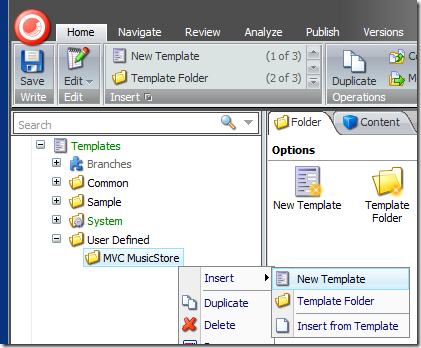 Add a new template folder underneath ‘TemplatesUser defined’ called ‘MVC MusicStore. Underneath that new folder, add a new template. 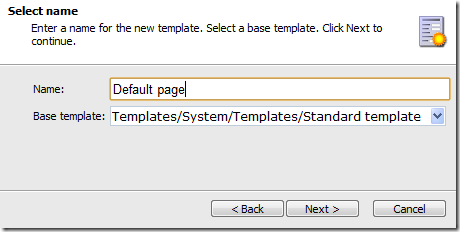 Call the new template ‘Default page’ and just let the base template field as it is. Click next, next, finish. Select your new ‘Default page’ item in the tree, and on the ribbon ‘Builder options’ click the ‘Standard values’ button in the template section. Unfortunately, Sitecore does not automatically detect all controller actions and registers them as a rendering, like BoC.Sitecore.Mvc does. I will update BoC.Sitecore.Mvc ofcourse, to auto register all your controller actions, but for now, you will have to add them by hand. 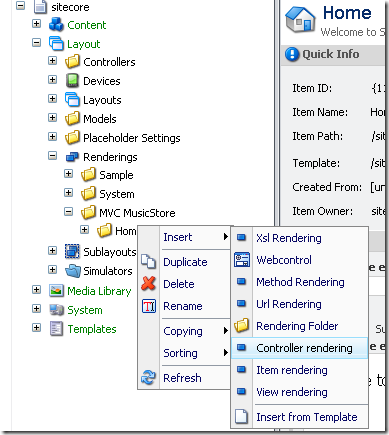 Select your new rendering, and in the content tab, enter ‘Home’ as the controller, and ‘Index’ as the action. Based on our previously created ‘Default page’ template, we’re now going to add the Sitecore items based on this template. 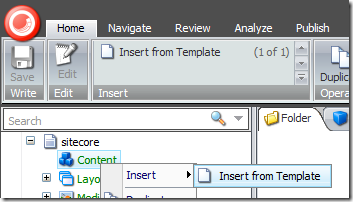 Open up the content editor in sitecore, and delete the exiting homepage item (/sitecore/content/home). Add a new Home item by click the ‘Content’ item with the right mouse button and choosing ‘Insert > Insert from Template’. IMPORTANT Notice the * in front of Genre and Id!. these are wildcard mappings! The nameof the items should be * and the displayname *Genre and *Id. Click the controls tab, and choose ‘Add’. That will bring up the ‘Select a rendering’ window. Choose Renderings/MVC MusicStore/Home/Index and enter ‘main’ as the placeholder name (remember we added that $Html.SitecorePlaceholder(‘main’) to _SitecoreLayout.cshtml?). Click on Select, and then on OK twice to save all your changes. Now, publish your entire site (! beware that if you’re using the sample database with the sample item template, that there is a worfklow attached to the new items by default! you need to approve them before publishing). After publishing, you can go checkout the homepage of your website. HEY! It’s just showing ‘default page’ ?? This is because by default, Sitecore holds a default.aspx in the root, and MVC by default does not trigger any route if the file exists on disk. You can enable routing for existing files by adding ‘routes.RouteExistingFiles = true;’ to the RegisterRoutes method in global.asax.cs, or you can just delete the default.aspx. I chose the latter one: just rename your default.aspx page in the root of your website’s folder to default.aspx.bak. Refresh your homepage. Much better, but now what! the navigation menu and logo are shown twice! Save the file, and check the homepage again: Looking just fine now! Though the website looks good now, all links are pointing to the /musicstore_api folder. Even though that will work just fine, that’s the native MVC you’re calling then. 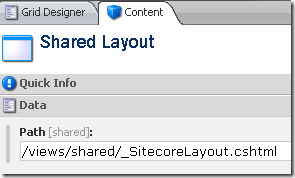 To point all links to the sitecore versions, we’ll have to change all link renderings. 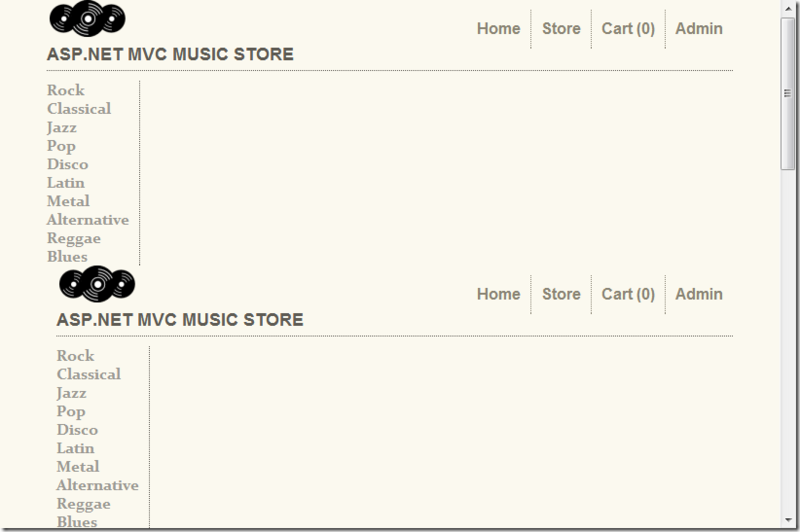 This is the most dramatic change in an existing MVC application. In fact, we’ll break compatibility here, since the links will become Sitecore specific. I haven’t figured out a way to keep this compatible. Then again, I don’t think you’d ever even want that. Thing is, with a standard MVC application, a controller action always has it’s own url. With SitecoreMvc any page in Sitecore can use the same MVC Action over and over again, on different url’s. This is so different, it’ll be impossible to keep things cross-compatible. Now, go change all the links in the project!. See how we’ve mapped Genre as a parameter? The wildcard resolver will pick that up. (See how this will go directly to MVC! 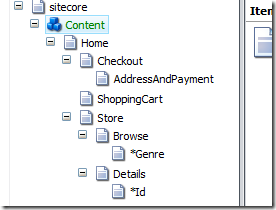 This won’t hit any Sitecore item, hence the url would become /musicstore_api/shoppingcart/removefromcart). 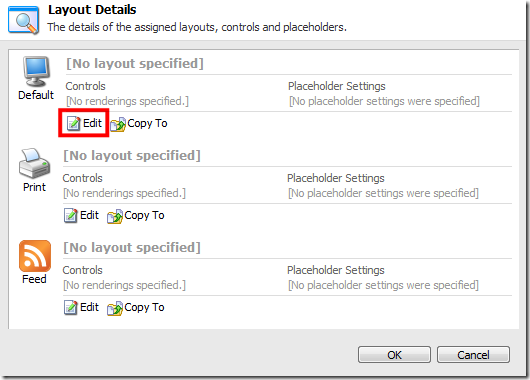 As a last step remove the Authorize attribute on the CheckoutController. In this tutorial, we’ll not be setting up Account related stuff, it’ll be taken care with in the follow-up of this post. Now run your project again! Everything but Account-related stuff should work fine now! Add albums to your cart, check out, etc. That concludes this tutorial for now. 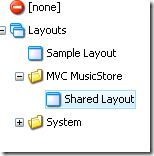 It should give you a good idea on how to get MVC up and running for your Sitecore projects.In the next blog post about Sitecore & MVC, I will explain how to use the Sitecore security in this MVC Musicstore and we’ll get rid of the external database by creating Sitecore items for the albums. I will try to add the new Model’s feature in Sitecore 6.6 for that. 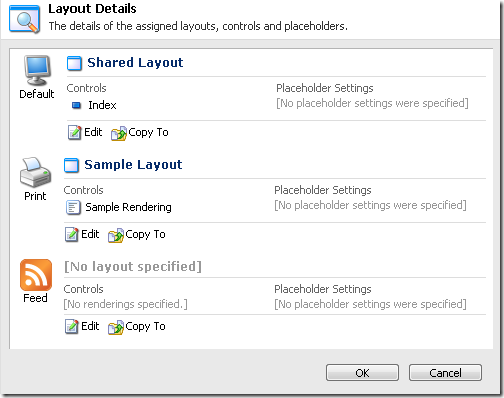 The albums will the be editable using both the Sitecore content-editor AND page-editor.